Spend the night in a treehouse at the Mohican Cabins in Ohio - Ohio. Find It Here. Mohican State Park, located halfway between Cleveland and Columbus, in Knox County, Ohio, is known by many as is an adventurer’s paradise and an outdoorsman’s dream — an outstanding location for canoeing, kayaking, hiking, fishing, camping and much more. 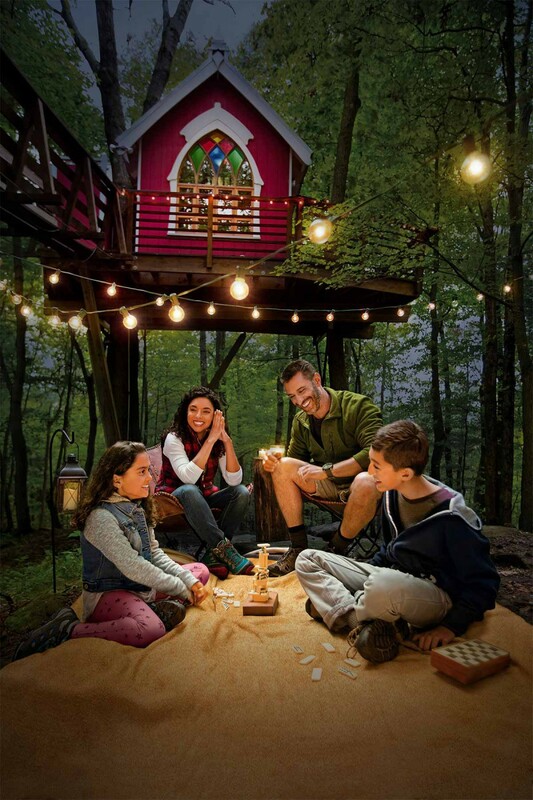 But even with all these great outdoor activities at Mohican, one of the most spectacular things about the area is that it plays home to one of the most unique lodging attractions in Ohio: The Mohican Treehouse Cabins. If you ever had a desire to live Swiss Family Robinson-style for a day, or wanted to bring back childhood memories of the treehouse you had in your backyard, The Mohicans Cabins in Glenmont, Ohio, offer above-the-ground accommodations in style! The cabins each come with charming names like “Little Red Treehouse”, “Tin Shed Treehouse”, “Moonlight Treehouse” and “The Nest” and a variety of great amenities. But no matter which option you choose, you’ll be treated to some amazing cabin amenities you wouldn’t expect in a rustic setting, including granite countertops, expensive linens, and flat-screen TVs with DVD players. For those who are more comfortable on the ground, four luxury cabins rentals are also available at The Mohicans, according to owner, Kevin Mooney. All The Mohican cabins — including the treehouse cabins — also have indoor plumbing with restrooms and fully functional kitchens, complete with coffee pots, mini refrigerators, and microwaves. Borrowing technology from the zipline industry, the treehouses are constructed upon platforms with heavy-duty bolts and hardware fastened to the trees to ensure safety, and to provide flexibility for when the trees inevitably grow in size over the years. These cabins are nestled in the treetops starting at around 20 feet in the air, allowing for beautiful picturesque views of the Mohican Forest, and providing a peaceful refuge for birdwatching or reading with a mug of coffee. The first of the treehouse cabins to be built at the Mohicans is the White Oak Treehouse, which was erected in 2012 and sleeps four campers comfortably. The rails of the White Oak Treehouse are taken from vines that were removed from trees in the area, and add a beautiful and rustic feel. The scene stealer, however, is the “Little Red Treehouse”, a two guest cabin built in 2013 and featured on the Animal Planet television program “Tree House Masters.” Originally called “The Brew Haus Treehous” and intended as the beer brewing site for the Mooney family, it was soon transformed into a place to sleep due to the growing demand. The beer-brewing equipment was relocated to The Grand Barn at the entrance to the Mohicans cabins, which serves as a spot for corporate retreats, weddings, and other events. The “Little Red Treehouse” stands out amongst the canopies due to its striking red exterior —an ode to the red barns dotting the Amish Country landscape— and its enormous head-turning stained glass window. The gothic-inspired structure is accessed via a 30-foot long extension bridge with a staircase ascending from a nearby tree. The inside is equally impressive, with a vaulted ceiling and cozy feel! When staying at The Mohican cabins in Ohio, there is certainly no shortage of fun activities to keep you occupied near Mohican State Park. You can try ziplining at Tree Frog Canopy Tours, canoeing with the Loudonville Canoe Livery, hiking the Mohican State Park, or attending a pow wow at the Mohican Reservation. For more great outdoor adventures in Ohio, Find It Here at Ohio.org.